Meg Murry (Storm Reid) doesn’t quite fit in at school. The popular girls regularly tease her. After her father (Chris Pine) disappeared, things only get worse. Her brother, Charles Wallace (Deric McCabe), is also seen as odd. He is smarter than the other kids in his grade and isn’t in to the same thing. After spending the day with a classmate name Calvin (Levi Miller), things take a turn for the bizarre. Meg, Charles Wallace, and Calvin are visited by three mysterious women, Mrs. Whatsit (Reese Witherspoon), Mrs. Who (Mindy Kaling), and Mrs. Which (Oprah Winfrey). The women tell the kids that Mr. Murry is still alive, but is trapped by a force of darkness called the It. Mrs. Whatsit, Mrs. Who, and Mrs. Which guide the children as they travel to another dimension in an attempt to save Mr. Murry. As magical as the worlds they travel are, there is also real danger. The It is consuming the universe with its darkness, causing anger, hate, and jealousy. They must find a way to get to Mr. Murry and save him before the darkness can take over. 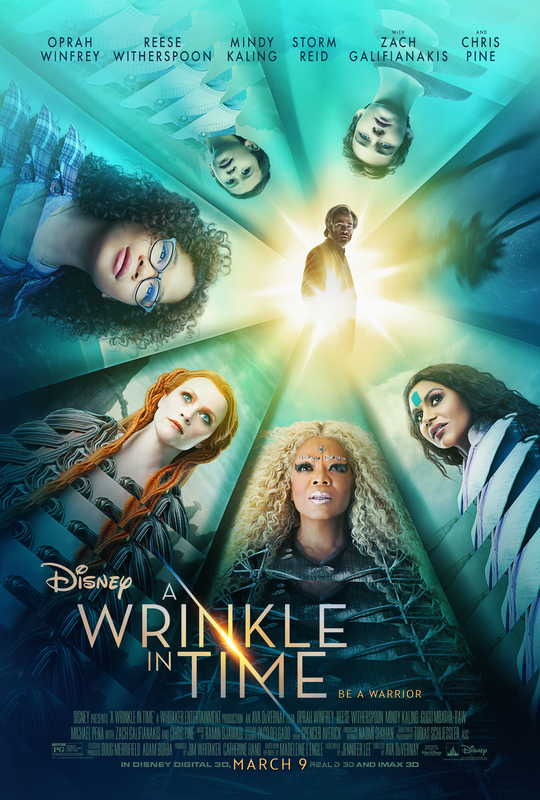 Based on the book by the same name, A Wrinkle in Time takes you on a journey through time and space while trying to teach a lesson at the same time. Unfortunately, the execution falls a little short. With a cast that includes such heavy-hitters as Oprah Winfrey, David Oyelowo, Chris Pine, André Holland, Zach Galifianakis, Reese Witherspoon, Mindy Kaling, Michael Peña, and directed by Ava Duvernay, the movie should have been an easy home run. The acting is alright. The kids in the film, Storm Reid, Levi Miller, and Deric McCabe, hold their own with the big names. It just isn’t at the level I expect from this caliber of stars. Where the film falters is in the story itself. I never read the book, so I’m assuming it holds mostly true to the original. The problem is that it moves a bit slow. It is also a surprisingly dark film. I’m not sure exactly who the audience is, but it can be a little much for younger audiences while not being quite enough to keep adults interested. However, this may not be the case if you have read the book. Not being able to find a consistent tone, it moves from magical, brightly colored planets to a young child dragging others through a dark world. Don’t get me wrong, the visuals are well-done, as you would expect from Disney. It’s just not enough to save the film. A Wrinkle in Time has a good message for kids about accepting your flaws and to not let being different get you down. The problem is the message gets lost in the mix. With the hero of the film being a middle schooler, perhaps that is the best audience. If your kids are any older, they most likely won’t be interested. Any younger and it may be too scary. If they fall in that sweet spot, or you are a fan of the book, then you may enjoy the film.